The development of Trade Unionism is a key theme in these items as they explore the formation of the All India Trades Union Federation followed by the conflict between this organisation and the All Indian Trades Union Congress. These developments are accompanied by contemporary press coverage of the ongoing dispute between mill owners and mill workers; the strikes themselves mainly preceding the Trade Disputes Bill which is also covered by press cuttings in this selection. The Communists found support amongst the Students' Unions of Cawnpore and Bombay; while the reports from the Federation of Indian Students Societies are rather less conclusive on this front. 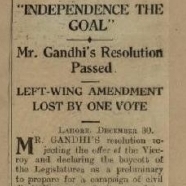 The press cuttings relating to the fight for self-governance in India reveal three core parties embroiled in this dispute. The Unity and Self-Rule campaign headed by Mahatma Ghandi, though much maligned in the press of the day, sought national unity and democratic rule; the pro-colonialist side is most visible through the sentiments expressed in opposition to the other campaigns through the media of the day; as the Self-Governance and Separatist movement, aided by the sentiments which fuelled the Bombay Riots that caused 12,000 deaths, called for the self-rule of a wholly Muslim state composed of those parts of India with the greatest concentration of Muslims. The media campaigns for Socialism and for Communism incorporate papers, journals and statements dedicated to espousing workers' rights. From media coverage of the Meerut trial to copies of Karl Marx's article on India, the AITUC's representation to Nehru, and Bradley's apparent decision to defend Communism in court rather than himself, many of the methods used to get the message across are included here. Bradley's final years and legacy are revealed through his research, from his tour of China in order to report on working conditions and Co-Operatives there to his manuscript notes on the history of Amalgamated Engineers Union. CP/IND/BRAD/06/02. Press cuttings regarding Indian and world affairs with particular reference to the formation of the All-India Trades Union Federation, the discord between the All-India Trades Union Federation and the Indian Trades Union Congress, and the ongoing dispute between Indian mill workers and mill owners. CP/IND/BRAD/06/03. Further press cuttings mainly regarding politics in India. These articles demonstrate a particular emphasis on two key subjects: the Lahore Conspiracy trial and the political struggle for Indian home rule led by Mahatma Gandhi, circa 1929-1930. Miscellaneous press cuttings re trade union activities in India, etc. CP/IND/BRAD/06/04. Miscellaneous press cuttings relating to trade union activities in India, etc. With a focus on the textile mill workers' strikes and the forthcoming Trade Disputes Bill which was passed in 1929. CP/IND/BRAD/06/05. Cuttings documenting the riots on the streets of Bombay that were initiated through rumours of Muslims kidnapping Hindu children. The riots were estimated to have resulted in over 12,000 deaths after Hindus responded to the rumours by forming crowds and killing Muslims who then responded with similar violence. The riots took place over 10 days in February 1929. CP/IND/BRAD/06/06. Cuttings from the Indian National Herald and Bombay Chronicle in relation to the Bombay riots. The focus of these articles is upon individual events during the course of the riots and upon labour leaders exhortations for all to cease the killing and return to work. CP/IND/BRAD/06/07. Cuttings from the Indian and British press regarding the Meerut conspiracy trial. These items focus upon the case for the defendants being tried by judge and jury, rather than undergoing a costly and lengthy trial at the Sessions. The also address the aims of the Communist Party in India as a whole and of those members of it on trial, and coverage of the court room proceedings. CP/IND/BRAD/06/08. These items include copy documents of Indian National Congress, issued by the Indian League; draft resolutions for the All India States' Workers' Convention 15.2.38; leaflets regarding Indian students' activities, Cawnpore and Bombay Students Unions, etc. ; a resolution of the Bombay Presidency Students Federation; copy articles of Karl Marx on India; ts article by R. Palme Dutt' "Congress Socialism" - a contradiction in terms; and a critique of the programme of the Bombay "Congress Socialist Group'" 7.9.34. CP/IND/BRAD/06/09. Papers include transcript 'Report on the electoral campaign in Sholapur'; resolutions of the Bihar Kisan Council Dec. 1937; a draft resolution on fundamental rights by M.N. Roy for Karachi congress 1931; a report of the Sangamner-Akola conference Sept. 1937; memoranda on joint editorship of the 'Congress Socialist' and on the Left Book Club in India; a draft resolution for the Delhi session of the All-India TUC; a statement on CSP Aug. 1937; an article on 'The Trade union movement in Cawnpore' by 'A Cawnpore Trade Unionist'; a statement of the joint conference of mill committees, Cawnpore, Sept. 1937; the article 'After the General Strike' (in Cawnpore) by Hansraj; memorandum of Mazdoor Sabha Cawnpore to United Provinces government enquiry; a report of the meeting of representatives of CSP in Tamil Nadu, Andhra and Kerla; ts paper 'Conditions of labourers in the Mysore state'; AICC Calcutta session Oct. 1937; memoranda on CSP organisational problems and work inside CSP; Andhra information Bureau report on M.N. Roy's tour of Andhra July (1937? ); article by Hansraj 'Congress Ministries in Action' Sept. (1937? ); representation of AITUC to Nehru Aug. (1937? ); CSP Report Aug. 1937; reports of discussion with Sundarayya re J.P.'s tour of Andhra; reports on the Punjab, the UNF and joint editorship of Congress Socialist, Dec. 1937; and political agendas from Oct. 1937. CP/IND/BRAD/07/01. File of miscellaneous cuttings and papers including Ben Bradley's manuscript notes on the Meerut conspiracy case and Bombay trade union work. Other items include notes on the Hindi alphabet, a brochure from Ben Bradley's return voyage to England, and press cuttings discussing Ben Bradley's release. CP/IND/BRAD/07/02. Leaflets relating to Indian politics in various languages (part handlist with papers), 1930s. These leaflets contain a focus on Students' associations with regard to their conferences and their elections; other politicial leaflets discuss local elections. These leaflets are in Hindi, Urdu, and sometimes English.